AM Plumbing & Heating - Central Heating Engineer, Plumber based in Mangotsfield, Gloucestershire. Hello we are AM Plumbing & Heating. 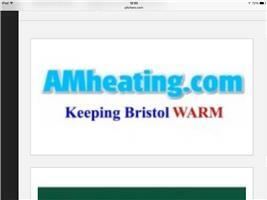 We are based in Mangotsfield, BristoI and I have been working as a heating engineer for over 20 years. I am a Worcester Bosch approved installer and also Viessmann trained. We can offer warranty's of up to 10 years on boilers fitted by us. We are also proud to be a Atag select partner offering our customers Europe's most efficient boiler range. We will undertake boiler changes, servicing and breakdowns. We also fit cookers, fires, bathrooms etc and offer a full plumbing service and Gas Safety certificates.